Builders on Brussels' pedestrian zone have been asked to work Saturdays as over-time to speed up the major construction project. 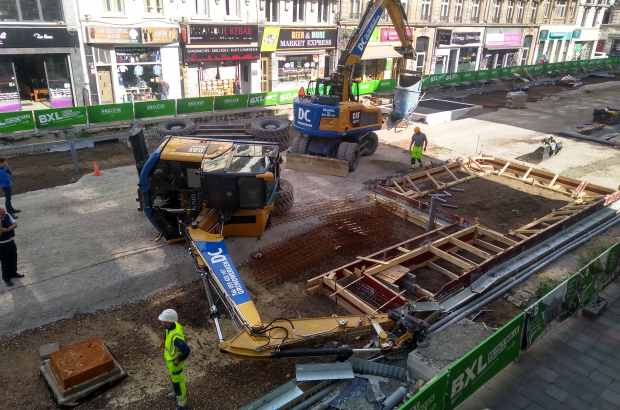 The City of Brussels has this week authorised Saturday working and has asked building contractor ViaBuild to move workers from other construction sites in the city to deal with the pedestrian zone as a priority. ViaBuild is fully stretched. As well as the downtown renovation works, the company is responsible for roadworks at Porte de Ninove and Porte de Hal. "Things are running on time," said Marianne Hiernaux, spokeswoman for project manager Beliris. "Everything should be ready for 2020. If the City of Brussels wants to go faster and pay extra to the contractor, we will take care of the necessary steps." The area in front of the administrative centre is now complete, and Place De Brouckère should be finished in early 2019. In the southern half of the pedestrian zone, some restaurants have complained about loss of trade over the summer as they were unable to put out their terraces. Work between Rue des Pierres and Place Fontainas is scheduled to be completed next spring. Fontainas is being used as a storage site for the works equipment and the final layout requires approval from the Stib. The City of Brussels hopes to receive the necessary planning permits next month for the area around the Bourse, which include the transformation of the stock exchange building into a beer museum.